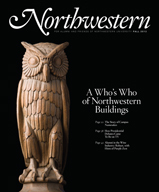 Northwestern is the quarterly alumni magazine for Northwestern University. Contact or contribute to the magazine. Reach 227,000 readers, including Northwestern undergraduate, graduate, and professional school alumni. Learn about ad rates, deadlines, and mechanical guidelines. President Morton Schapiro, right, and Shannon Farhoud (J12) at the inaugural Commencement for Northwestern University in Qatar in May. Photo by Vedran Strelar. Tell us what you think. E-mail comments or questions to the editors at letters@northwestern.edu. Ever wonder about those strange designations we use throughout Northwestern to identify alumni of the various schools of the University? See the complete list. We’re just about to start the new academic year at Northwestern, something I always anticipate eagerly because it means it’s time to welcome new students, renew friendships with alumni and start teaching again. I enjoy a break in the summer, but by September I’m ready to go. This year is no different, as we’re coming off a remarkable 2011–12 academic year and starting an extremely promising new one. Before we move forward, I am proud to note a few distinctive achievements that occurred this past year. First, we held the inaugural Commencement for Northwestern University in Qatar on our campus in Doha. A total of 36 pioneering young men and women from 17 countries received degrees in journalism or communication from NU-Q, as it has become known. It was a transforming event in which I was very proud to participate. The Arab world is undergoing dramatic changes; our graduates, and NU-Q itself, will play important roles in shaping those changes. Second, our students, faculty and alumni continued to be recognized for their pathbreaking work in many fields. A 2011 graduate, Sarah Smierciak (WCAS11), won a Rhodes Scholarship, and our students received many other prestigious fellowships. Teresa Woodruff (G89), professor of obstetrics and gynecology, received a Presidential Award for Excellence in Science, Mathematics and Engineering Mentoring for her program that mentors minority high school girls for college and careers in those fields. A dozen of our faculty members were elected to the top academic societies in their respective fields. And our athletic teams continued their string of successes, with the women’s lacrosse team capturing its seventh national championship in the last eight years, and 12 of our 19 teams advancing to NCAA postseason play. These and other recent accomplishments in many fields reinforce one of the distinguishing characteristics of Northwestern that I’ve come to appreciate during my tenure here: the remarkable breadth of this institution and its constituents. There’s probably no way to be certain, but Northwestern is likely one of very few institutions that can claim to have had its students, faculty or alumni win all of the following: Nobel Prizes, Academy Awards, Tony Awards, Rhodes Scholarships, MacArthur “genius grants,” Pulitzer Prizes, National Book Awards — and World Series and Super Bowl rings. That’s an impressive array, and it speaks volumes about the wonderfully diverse mix of individuals whom Northwestern attracts and who succeed in many different areas. Northwestern is an institution that values both creative energy and analytical skills. That unusual mix, along with Northwestern’s growing reputation, attracts some of the best students in the world. This month we will welcome a remarkable group of new undergraduate, graduate and professional students to Northwestern University. This year’s entering freshman class includes students from 47 states and 30 countries, with superb academic quality as measured by SAT/ACT scores and class rank. They were selected from a record 32,000-plus applicants, of whom Northwestern admitted approximately 15 percent. (To give you some perspective on those figures, a half-dozen or so years ago Northwestern received approximately 16,000 applicants and admitted one of three.) In addition, an increasing number of students are choosing to apply via early decision, meaning that Northwestern is their first-choice school. At the graduate and professional levels, we also see continued strong numbers of applications. So there’s no question that even in challenging economic times, a Northwestern education is viewed as exceptionally valuable. We’re working to make that education even better. As you may know, Northwestern launched a new strategic plan last fall. The plan presents a compelling vision for the future and is a blueprint for leveraging our strengths and realizing our potential. With more than 160 years of history and tradition, Northwestern has a distinguished past. But that past propels us forward rather than holds us back. Northwestern’s founders were visionaries who established a new university designed to serve a vast region of the country. Today our vision is even more expansive, as we expect our faculty researchers, our students and of course our alumni to have an impact on the entire world. Alumni support is critical in enabling the University to accomplish its objectives. The collective impact of annual gifts allows us to invest in teaching and research and enhance our students’ experiences. In addition, this assistance from our alumni, parents and friends sends the message that they share in our vision for the future of Northwestern. So I hope you’ll join me in supporting the University, and I also very much hope to see you at an alumni event, either here on campus or wherever you may live. I’ll be traveling to alumni gatherings around the country, as well as internationally, so if you have the opportunity, please join me and your fellow members of the Northwestern community in celebrating this great University.